Web design is a constantly evolving media, and Internet users are constantly on the lookout for the latest and the best online experiences. If your site is due for an upgrade, here are some trends that are about to break through that you must be aware of; you will want to evaluate whether some (or all) of them are a good fit for your business. Before 2013, web designers used a graphic technique called realism which included shadows, bevels and gradients. In that year, designers devised a new technique called flat design. It removes almost all of the extras in stylization to the graphics and has a very modern feel. Solid and vibrant colours are used against bold, blended palettes with this design style. Mobile users are set to become the majority of website viewers. Responsive design and development gives websites scalability so that it can be viewed easily on desktop computers and mobile devices without sacrificing functions. Specialized fonts will become more commonplace, as they have become easier use with all browsers. Web designers can match fonts to brand messaging without having to be as concerned about a misrepresentation on different browsers and devices. 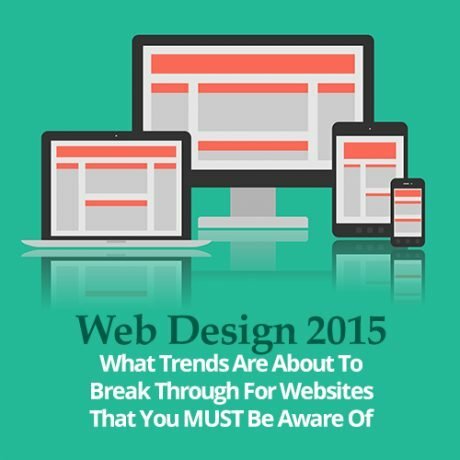 High-definition images will be considered a must-have for websites in 2015. Quality is all-important, and text will be layered over a compelling image to get a customer or client’s attention. ReferLinks can provide you with a custom website design that reflects your business brand to your advantage. We take the time to understand you and your potential customers to provide you with a unique online identity. Contact us to discuss your vision for your new website now. This entry was posted in Design, Website and tagged Blogging Ontario,Blogging Toronto,Marketing Ontario,Marketing Toronto,Online Marketing Ontario,Online Marketing Toronto,Pay Per Click Ontario,Pay Per Click OntarioSEO Toronto,Pay Per Click Toronto,SEO Ontario,SEO Toronto,Social Media Marketing Ontario,Social Media Marketing Toronto,Social Media Ontario,Social Media Toronto,Website Ontario,Websites Toronto on November 25, 2014 by ReferLinks Online Marketing.